You could find any book on any topic you could think of – if you knew where to look. Everything was categorized by the ever popular Dewey Decimal System. With the Dewey Decimal System as your guide (and a little luck thinking of the right keywords and categories to look under), your map to knowledge was organized into adorable little drawers (card catalogues) that were lined up along the length of the library. But – it was also very time consuming to find what you were looking for. You had to thumb through the cards to figure out which books you needed – and judge by their cryptic descriptions whether or not you wanted that book. If you didn’t know exactly what you were looking for or were looking for books on an obscure topic, you might have to check several sections where books on that topic “might” be before finding what you needed. If someone was in the drawer you needed, you had to wait. If you needed multiple books on different topics, you had to thumb through multiple drawers. Same thing if you were studying a topic that could be cross referenced in multiple categories. And heavens forbid if after all that, you went to the shelves to find your book, only to discover – it had been checked out! Now that you have that image (or memory) in your head, think about your business data. Do you have many systems cobbled together that contain different sets of data, causing you to go from one system to another in order to run a report? Maybe you even have business intelligence (BI) software in place, yet finding your data and creating those reports still seems challenging – or slow because the system can’t handle retrieving real-time data on top of transactional processing. Setting up a data warehouse is like taking all the great things about card catalogs and the Dewey Decimal System and making all that data more accessible and efficient to use. Our point: Business intelligence tools make reporting easier, but data warehouses are what make your data usable. Raw data is just that – raw. A large part of what makes data accessible and easy to use is the way it’s stored. It has to be technically compatible with your systems, and the format of the data has to make sense. Whether you’re working from multiple systems or have a single-screen BI dashboard in place, if you don’t have a data warehouse set up, your data may still be inaccessible and hard to use – and that won’t yield the answers you’re looking for. A data warehousing system does more than simply hold your data. Your data warehouse stores raw data that has been manipulated by developers in a way that makes sense for your organization. The data is collected from multiple sources (including your business software and applications). Then it’s standardized and organized in a way that your reporting system can understand and access that data easily. Once the data is integrated into your system, it’s presented to users in a format that’s easy to understand and use. That can be anything from spreadsheets to a single-screen BI dashboard. Simply implementing a BI solution without the use of a data warehouse does not guarantee that the data is going to be reliable, timely, or easy to find. The raw data needs to be cleaned up, restructured, and renamed so that it comes out making sense to your users. Another benefit to having a data warehouse is its ability to integrate multiple data sources across your organization. A properly set up data warehouse receives information in real time and gives you the big picture view needed to analyze, track, report, and make better decisions. While this sounds like something a BI solution offers outside a data warehouse, the difference is that with a warehouse, when your software needs to be updated, there’s no need to rewrite or test reports. The data stays safe and organized the way it was set up from the very beginning. Even if you completely change your CRM or accounting software, it doesn’t matter – the data will remain the same because of the warehouse you’ve set up. Another issue with integrating data from multiple systems is the way in which the data is formatted. Data sources can spit out data in lots of different formats. Dates, for example, could be in numerical form with the year first (i.e., 20160715), with or without dashes or periods between the month-day-year numbers, or written out into words. That’s what makes the need for a data warehouse crucial. Data warehouses can pull in that data, consolidate it, and transform it into a format that is easily retrievable and consumable. In addition to collaborating with your systems, a data warehouse has the ability to store all your historical data in one easily accessible place. Retention of data history is not something an end-user application is capable of doing due to space and other restrictions. A data warehouse can track alterations of your data and provide you with a complete history of changes, deletions, and additions. A data warehouse can significantly increase your team’s efficiency because of the way the data is stored and set up to retrieve. Data warehouses can transform production data from a high-speed data entry model to a data model that supports high-speed retrieval. The efficiency comes in multiple ways. First, the uniformity with which your data is stored makes data retrieval much faster for the end users. As we mentioned in the last section, when you have a data warehouse, data is transformed into the formats your systems and your people can most easily process and understand. It can also be categorized and tagged, so the data can be found by any user who needs it. Done properly, this has the potential to make creating reports easy for anyone to do themselves with no need to get the IT department involved – and that can save huge amounts of time and resources. Another way data warehouses increase efficiency is in the speed of data retrieval. Running reports directly against operational systems can cause performance problems. Having a data warehouse makes that a non-issue, because the data is stored separately from the program you’re using to create reports. Having a data warehouse makes searching for historical data more efficient, too, because it’s all in one place and in a format that is optimized for read access. This results in faster report generation. 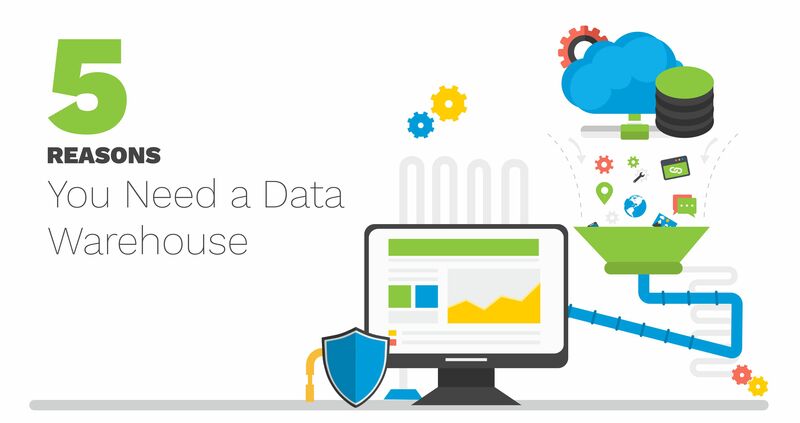 Data warehouses are what sit between the source applications within your company and the BI software you use. While they do exist to store large amounts of data in one central location, they also exist to properly clean and categorize that data. Setting up a data warehouse creates an ideal opportunity to predigest some of your data – that is, to create metadata for further insights. Metadata is simply data about data. Sounds boring right? The beauty of metadata is that it gives your data drill down capability. Metadata allows users to drill down into details about their data. That in turn helps users gain more insights or even uncover hidden insights. This is where the “magic” happens of putting together pieces of information that perhaps seemed unrelated at first but that actually show important trends that could affect major business decisions. Think of metadata like DNA – the genetic makeup of your data. Without metadata – or a data warehouse for that matter, data mining is not possible. With a data warehouse, all your data is sent to one, central location that usually lives on its own server. That means your data is backed by four sources: the original source, its backup, the data warehouse, and the backup for the data warehouse. A data warehouse also makes it easier to provide secure access to users who need specific data but who shouldn’t have access to everything. It’s just a more secure way to handle and store data. It’s easy to see the value in business intelligence, because with it you can see the fancy reports before you make big decisions. A data warehouse provides its value behind the scenes. It makes all those fancy reports and analytics more accessible and easier to create. Let’s go back to the library and the Dewey Decimal System. Back in the days of the card catalogue, if you wanted to find the right books, you really needed to know that system. You had to know what you were looking for and where to find it. But once the Dewey Decimal System was supplemented by software, it acted as the go between. Now you can search keywords, authors, titles, topics etc. to your heart’s content. You can drill down into the system to locate the best sources for your research (even if they’re spread across categories), and you can do it efficiently. That’s the power of a data warehouse. Your most important information, stored securely, organized in a format that is going to be easily used by the people in your organization – accessing that data quickly and in an organized fashion makes your all-powerful Big Data even more powerful.